Until my oldest daughter, at age 7, decided that she was interested in being a Memory Master, we did not make it an effort to memorize everything. We listened to the Memory Work CD incessantly in the car. She learned the History songs and, now that we have the stellar timeline song, the timeline. We talked about the memory work. We familiarized ourselves with it but that was it. If you try to force your child to learn all the memory work at a young age, one of you will be burned out by the end of Foundations. The other of you will probably hate learning. If your child starts Foundations at age four, he/she will go through each cycle two or three times. What fun will it be the second and third time, if he knows everything already? Picture the memory work as a spiral. Each time you go through the cycle, the spiral is getting bigger because you are adding to it. The first year we did Cycle 3, my daughter could not read yet. She memorized the History songs and we drew pictures of each sentence. We talked about how organized God made our bodies. We played and had fun. That was about it. The second time, she was a reader but not really, really independent yet. This time, we wrote the History sentences and did some games. We also listened to the corresponding Story of the World audiobook. Luckily, my dad had gotten her a Kindle for Christmas. She had an app on the Kindle with the states and an app about human anatomy. She played and learned about both. We read more concerning history and science together. It was fun. This is the third and final time she is doing Cycle 3. This time, she is a totally independent reader. We read some fun chapter books together like Johnny Tremain to prepare for (gulp) when she is in Challenge A. She reads nonfiction and fiction related to the history and science by herself. She has some books similar to textbooks which we use to acclimate her to using official textbooks (we talk about layout, skimming, scanning, bold-faced words, etc.). I am always looking for readers and for audiobooks related to our subjects. Foundations is designed for this spiraling and scaffolding. As a Challenge tutor, I attest that it has helped me immensely to have gone through the three Cycles and each time I learn more! Homeschooling takes commitment. It is hard. Just like marriage, breastfeeding or birthing a baby, it is well-worth the commitment. Do not give yourself a couple of weeks, but a couple of years or more. As someone who taught in public school, I had a pit in my stomach when I felt called to homeschool. What if I mess my daughters up? I did not want to go against the grain. Compulsory education, though, in the history of the world and of the United States is a new thing, not homeschooling. I have used that as my mantra often. Another thing one of my Classical Conversations’ friends told me (and it helped me immensely) was that my daughters might as well have my bad habits as anyone else’s because I could deal with my own bad habits rather than some bad habits they picked up from a teacher or their classmates. This is a reason I love Classical Conversations: I can share the burdens I feel with others. We can pray for each other and commiserate together. God takes care of us. Pray, pray, pray and read, read, read the Bible. My children have their own Bible curriculum that we use in homeschool but make sure you are praying and growing in your knowledge of the Word. Pray for the big things like their friends and their future husbands/wives. Pray for the little things like that they will understand the function of a silent e. Pray that you will go the correct pace. Do the important things first. You know that your child needs to learn to read, write and do math. Those things I have always done deliberately with curriculum and with goals. The other things will come, but those first few years, concentrate on the important things. Talk to your child about God and ask them questions. Analyze things together. When you are talking in the car, ask them questions. Why does McDonalds always have those arches? What does this song mean? My girls have learned valuable critical thinking skills just by questioning things. Get yourself the right tools for teaching. 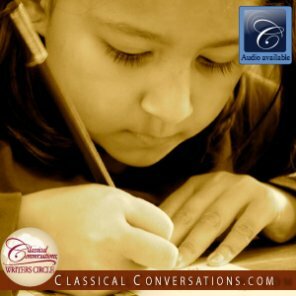 This year I am using a checklist like the one I found on Half-a-hundred Acre Wood (http://www.halfahundredacrewood.com/2014/07/curriculum-schedule-classical-conversations-at-home.html) for each of my girls. They love checking off that they have done their subjects. I also rely on the songs on CC Connected for things that are harder for us. We love the little dry-erase boards and the re-writable dry erase markers from Staples. Do not compare yourself and your children with others, including public school students. Do not worry about putting in the same amount of hours as public school students—they spend a lot of time being managed and transitioned. You don’t need to do that. Do not compare your children to other people’s children—we homeschool because we want a specialized education for our students. Do not compare yourself to other homeschool moms (I know it is very hard not to do so!). Keep your eyes focused on the goals you have (by you, I mean you, God and your husband) for your child. Please, hang in there. Homeschooling is a hard journey but so worth it!